In this day and age, finding beautiful earrings is not that hard – pairs and pairs await in virtually every jewellery store, no matter how small. However, sourcing an original, individually crafted pair is an entirely different story. If you care about what you wear, if you appreciate original designs and if you really, really don’t want to wear what everyone else is wearing, then these stunning pairs will be right up your alley. KaroonCreation is an Etsy shop that’s all about elegant jewellery. The creations in the shop are incredibly sophisticated and intricate: a multitude of design elements blend together, making the final products appear almost poetic. For proof, look no further than these gorgeous chandelier earrings. The 16k gold plated top part seamlessly transitions into a mix of off white beads and cotton fringe. Loving what you see? The design is also available in iridescent blue and violet. Find all the links in the original listing. ArtiKats is an impossibly charming brand created around handmade, minimalistic jewellery with a twist. The simple designs have special, unexpected elements or pops of color which catch your eye and draw you in for more. 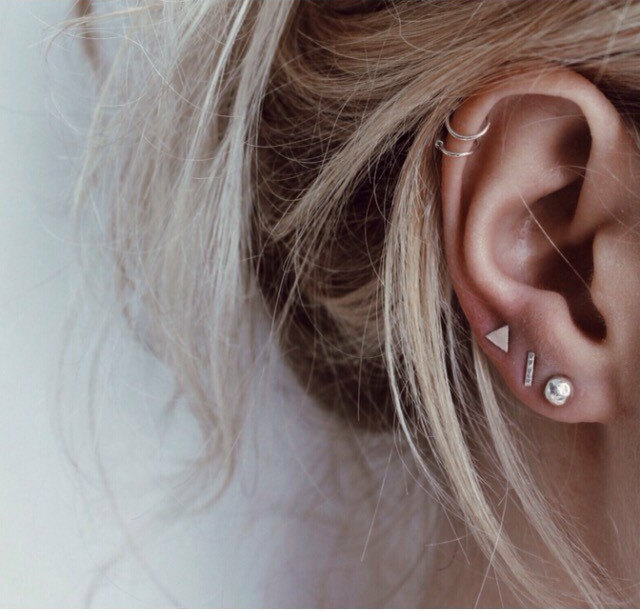 Let’s take a look at these geometric ear jackets. Hand crafted out of sterling silver, they are the perfect pair to wear on an everyday basis. The round pebbles at the front are sublimely complimented by a wavy square back – so chic and cool! Note that you can mix and match the back with other stud earrings you may already have. Or simply wear the pebbles on their own. Shop them now by following the link above. Brave Chick is a brand with a mission: to create artisanal, handmade jewellery that inspires and empowers women. A percentage of all sales are donated to non-proﬁt organizations which aid women and girls in need. Jewellery with a cause! Of course, all the designs in store are sleek and highly polished. So much so, that you’ll have trouble picking your fave! Well, let us step in and suggest this exquisite rectangular pair. Capable of elevating any outfit, these earrings are, in the words of their designer, crazy simple and crazy gorgeous at the same time! Don’t try to resist the temptation: you can find them in the link above. Wild Fawn Jewellery creates minimalist, eco-friendly jewellery. Hand made and, when possible, even crafted out of recycled sterling silver and gold, the pieces are dainty and exquisite – you’ll fall in love with each and every one of them! Kick off your addiction with these adorable earrings: available as sets of either 3 or 6, they can easily be mixed and matched in whichever way your heart desires. The main designs are: a bar earring, a triangle earring and a pebble earring — as modelled in the photo above. So, which combination will it be? Make up your mind by visiting the link above! If you’re not one to shy away from a burst of color, these mesmerizing earrings are for you! Malisa Jewellery makes stunning soutache and handmade crystal gemstone jewellery in some of the prettiest color combinations you’ve ever seen. Clearly, this shop is not to be missed and these fuchsia should be at the top of your must-buy list. The extra-long tassels dangle from an elaborate top part created using the soutache technique. A symphony of beads, shapes and textures make these earrings irresistible! Shop them now via the link above.